The Earth-centered Universe of Aristotle and Ptolemy held sway on Western thinking for almost 2000 years. Then, in the 16th century a "new" (but remember Aristarchus) idea was proposed by the Polish astronomer Nicolai Copernicus (1473-1543). There is a common misconception that the Copernican model did away with the need for epicycles. This is not true, because Copernicus was able to rid himself of the long-held notion that the Earth was the center of the Solar system, but he did not question the assumption of uniform circular motion. Thus, in the Copernican model the Sun was at the center, but the planets still executed uniform circular motion about it. 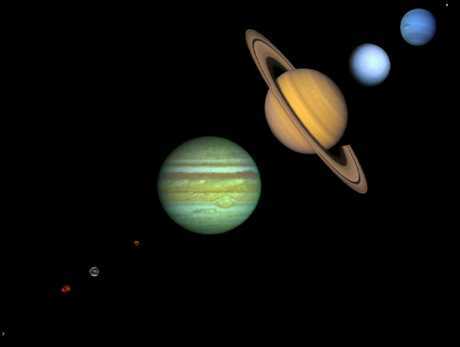 As we shall see later, the orbits of the planets are not circles, they are actually ellipses. As a consequence, the Copernican model, with its assumption of uniform circular motion, still could not explain all the details of planetary motion on the celestial sphere without epicycles. The difference was that the Copernican system required many fewer epicycles than the Ptolemaic system because it moved the Sun to the center. We noted earlier that 3 incorrect ideas held back the development of modern astronomy from the time of Aristotle until the 16th and 17th centuries: (1) the assumption that the Earth was the center of the Universe, (2) the assumption of uniform circular motion in the heavens, and (3) the assumption that objects in the heavens were made from a perfect, unchanging substance not found on the Earth. Copernicus challenged assumption 1, but not assumption 2. We may also note that the Copernican model implicitly questions the third tenet that the objects in the sky were made of special unchanging stuff. Since the Earth is just another planet, there will eventually be a natural progression to the idea that the planets are made from the same stuff that we find on the Earth. Copernicus was an unlikely revolutionary. It is believed by many that his book was only published at the end of his life because he feared ridicule and disfavor by his peers and by the Church, which had elevated the ideas of Aristotle to the level of religious dogma. However, this reluctant revolutionary set in motion a chain of events that would eventually (long after his lifetime) produce the greatest revolution in thinking that Western civilization has seen. His ideas remained rather obscure for about 100 years after his death. But, in the 17th century the work of Kepler, Galileo, and Newton would build on the heliocentric Universe of Copernicus and produce the revolution that would sweep away completely the ideas of Aristotle and replace them with the modern view of astronomy and natural science. This sequence is commonly called the Copernican Revolution. There are many examples throughout history, including in modern times, where a theory, or a part of a theory, is proposed and doesn't catch on initially but only later bears fruit--and possibly with later proponent gaining credit that is really deserved by the originator. I think the example of Aristarchus is a poignant one. If the Earth were actually on an orbit around the sun, why wasn't a parallax effect observed? That is, as illustrated in the adjacent figure, where stars would appear to change their position with the respect to the other background stars as the Earth moved about its orbit, because of viewing them from a different perspective (just as viewing an object first with one eye, and then the other, causes the apparent position of the object to change with respect to the background). Note that Copernicus himself originally gave credit to Aristarchus in his heliocentric treatise, De revolutionibus caelestibus, where he had written, "Philolaus believed in the mobility of the earth, and some even say that Aristarchus of Samos was of that opinion." Interestingly, this passage was crossed out shortly before publication, maybe because Copernicus decided his treatise would stand on its own merit.